On the morning of November 14, 2018 as my husband Chase Parker walked outside to put his boots on for work he heard a ruckus in our field beside our house. Several bucks were in full rut chasing multiple does around and around in the field. My husband stood there watching as several small bucks and another eight point fought among each other and ran after the does, until he glanced behind the large group of deer and saw an enormous buck in the background. 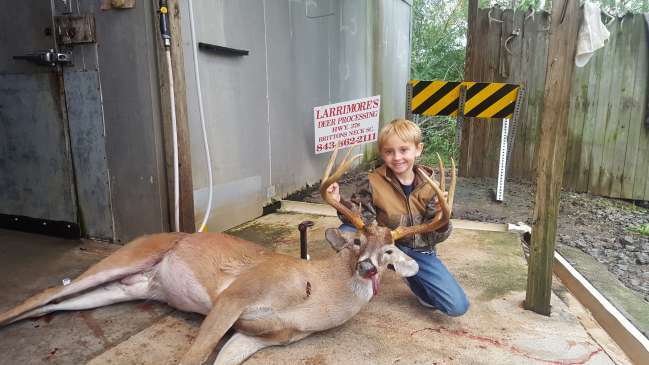 He was then faced with the quick decision to shoot the buck himself, or let his six year old son Bentley who had been hunting nearly every weekend during hunting season for the past two years chasing a buck of this magnitude do so. For him, the decision was easy. He knew this would be a moment neither of them would ever forget. He ran inside, yelled for our son Bentley, and quickly grabbed his 300 blackout rifle that our son had become an expert marksman with. Miraculously upon getting back outside the buck was still there and paying them no attention with his mind focused on something else. My husband got him situated, pushed the safety off, and whispered to him ?Take your time buddy. Don't miss?. He pulls the trigger and the buck bows his chest out, but does not move. He quickly inserts another bullet in the chamber and tells him to shoot him again. This time as he shoots, the buck tenses up. From my husband?s experience, he is certain this is a hit, but loads another bullet hoping to get one more in him before he either drops or exits. On the third shot the buck tries to run off, but falls a very short distance away. Bentley is adamant in telling his father he knows that the buck is going to have three holes in him because he ?doesn?t miss?. Indeed upon retrieving the buck, he has three bullet holes in him. Our son was overwhelmed with excitement, high fiving his father and squealing, as his biggest harvest to date was a five point with a broken rack. Out of the six deer he has harvested, we were lucky enough to catch four of them on video, but unfortunately with this one all happening so fast we were unable to do so. While we may not have it on camera, it is something that is embedded in our minds forever. To this day he makes sure he asks every single person he meets or hasn?t seen in a while if they have seen his big buck and that he is going in the state book. This is a moment we will cherish forever with our son and what our hunting tradition is all about!